E: Sometimes it’s difficult to find appetizing food from the southern Asian region. When the choices are basically Vietnamese, Malaysian or Filipino, Victoria does have the gambit covered. But James and I wandered up north, along Fort Street, to find a gem of a restaurant, Sookjai Thai — and one cute waitress too. J: Go for the food, stay for the waitress, huh? Sookjai has been on the scene since 2003 when the restaurant switched owners. The previous occupant (using a different business name) ran the place as an Italian restaurant. But there’s no need for a history lesson here. After walking in and noticing the ambience, I was hooked. The place says “fine dining.” At Sookjai, there’s no need to pawn your watch to pay for your meal. If it came down to it I could’ve sold a pint of blood (I was willing to sacrifice Ed’s just in case). The prices are really that good and so is the food… Oh yes and the waitress too, right Ed? E: She was a definite darling with her sunny disposition and charm. And after embarrassing myself by playing with a stuffed doll from the Legend of Zelda videogames (I bought it at Fan Favourites), her giggle and smile made my day. Even her suggestions in what to get was a plus when I wasn’t sure in what to go for. Well, James deserves some credit too when both of them said get the spring rolls. The banana stuffed delights were surprisingly awesome. The way the banana was warmed to a soft consistency with a crispy exterior was simply exquisite. And I could easily make a meal of this alone! J: Ed had Link out of the bag and was caught playing with it. I haven’t seen Ed’s face turn that red for a very long time. E: Hey, I love making the cute sounds Link makes when he confronts danger. 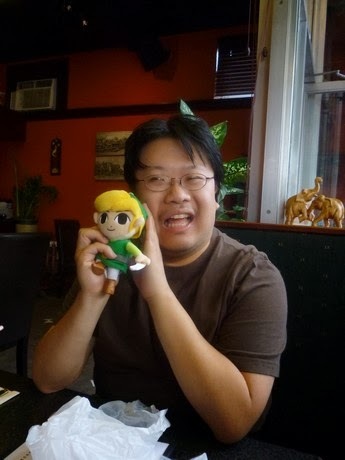 I was poking James with Link’s sword since he was taking more than his share from the rolls. We should’ve ordered an extra dish. J: The banana filled spring rolls were excellent as Ed said, and for days afterwards I praised the rolls to one of my friends. Now she wants me to return to Sookjai to buy her some. After the rolls, the fried tofu appetizer with the chilli sauce went down well but the best was yet to come. E: There’s a trick to eating fried tofu cubes. I’ve had them before on their own but it was never that good. Here, the trick is to give a gentle drizzle of orange juice on top. The flavours are nicely brought out. Both appies went fast while waiting for our main dishes, and they were big! 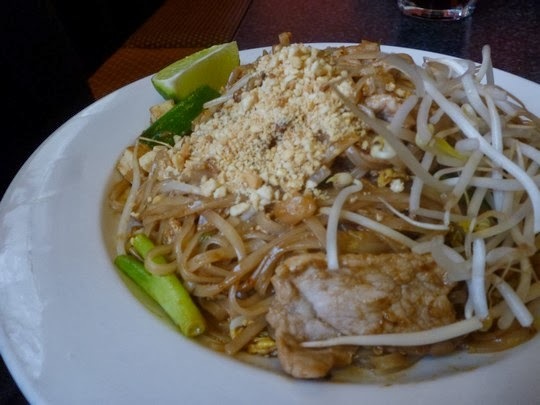 J: My Phad Thai Moo dish was beautifully made up. It was cooked fresh and with a skill I have not tasted before at Thai restaurants. It did not taste like it was reheated like my dinner at Little Thai in Langford. The noodles were hearty; it had a flavour that was accentuated by the strips of chicken and the crushed peanuts. Sookjai actually uses mostly crushed peanuts unlike Siam. That was a disaster when the peanut sauce tasted like mud after mixing with the cooking oil. Here there was no mess and my meal suffered little from any oil used. I suspected a flash fry and that would mean our cook is at least competent. E: My Phad Thai Goong ($13.50) dish was just as delicious, and I concur with James’ statement about how well cooked it was. The flash frying did a better job to bring out the prawns’ flavour than with any other method. I could get used to coming here to see how the chef handles other sea life. J: Or how the waitress handles the drinks right Ed? Sookjai is worth returning to for the banana spring rolls. I’m looking forward to trying their other seafood dishes. And according to our server, they’re open for lunch on Saturdays. But should they open for lunch on Sundays, that’s reason enough for me to have lunch after the weekly sermon from our priest at Christ Church Cathedral. This entry was posted in Food, Reviews and tagged Asian, British Columbia, Thai, Vancouver Island, Victoria. Bookmark the permalink.